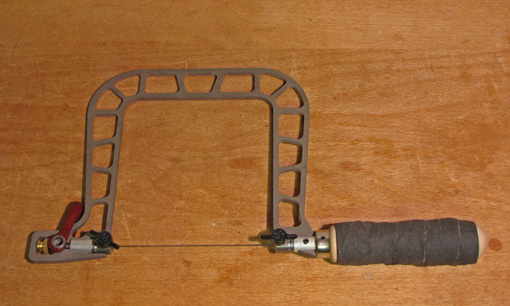 This coping saw frame is an old one made by Eclipse in England. The handle, threaded stem, proximal blade anchor, and the yellow tabs are transplants from an otherwise poorly designed $8 Irwin saw. The handle’s rounded triangular cross section and comfortable grippy material make it less fatiguing to use than the wooden original. Small frame-type saws like these lack the robust rigidity of their larger cousins and thus perform better cutting on the pull stroke, which also happens to be more natural and efficient when it is used vertically. I like Olson CP304 blades for general work (.020″ thick, .125″ wide, 15 tpi). The CP301 blades are slimmer (.018″ thick, .094″ wide, 18 tpi skip tooth) and may fit into the kerf of some dovetail saws when used for removing waste, though the total set of these blades varies from about .002″ to .008″ in the ones I measured. CP307 (32 tpi) are handy for the inevitable metal cutting that woodworkers do. In addition to “serious” work, the coping saw is great for very young kids who tend to dig in and stall with heavier handsaws. The coping saw seems to avoid this because the blade is under steady tension, helped along by the pull stroke. The blades, of course, are inexpensive. Clamp the wood firmly for the little woodworker, who should use two hands on the saw. You will be the only one who cares if the cut is straight. Even at younger than four years old, my son and daughter played in the shop with me, sawing little wood pieces, building little things, and making big memories. Knew Concepts takes coping and fret saws to vastly higher levels. I have an earlier model 5″ titanium frame fret saw. This style is currently available in aluminum, in addition to the newer “bird cage” titanium model. 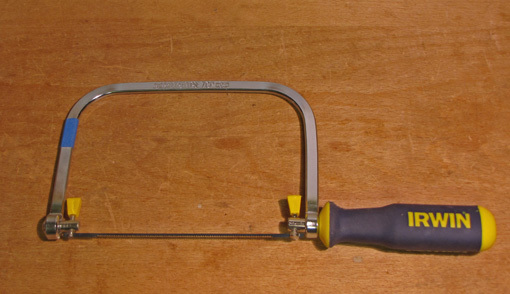 They also make a similar coping saw. These saws are amazingly light and rigid, plus offer a convenient cam lever tensioning mechanism and indexed blade tilt adjustment. This saw is excellent for inlay work using #2/0 blades (28 tpi skip). Again, the pull stroke setup is best. I wrapped the handle in black friction tape. It is by far the best saw I have used to remove dovetail waste. You can get very close to the baseline using a single cut. This makes chiseling the remaining waste faster and, with less push back of the chisel, more accurate. The fret saw blade easily fits into the kerf made by most dovetail saws, and can be redirected sideways within one stroke. After experimenting, I found #3 blades (Pegas brand) to be the best for this task (.0118″ thick, .038″ wide, 19 tpi skip) – faster, narrower, and cleaner than the #5 (.0145″ thick, .043″ wide, 16.5 tpi skip). Knew Concepts saws are examples of tools for which we might otherwise have complacently accepted the limits of the standard designs. Next: miscellaneous saws that solve problems. Thanks for the link to the Pegas blades and your experiments. Finding the right blade is crucial. Had my Knew Con fret saw for a few months. Wow you are so right about those. My dovetails have never been cleaner. Regarding the chisel problem, most of my chisels have a bevel on the sides that runs up far enough that I can get into a dovetail corner with relatively few problems. Wouldn’t this only be an issue with mortising chisels? Or maybe I am reading it wrong. BTW I have never commented on here, but I love your work, and your blog is wonderful. I have read the great majority of your posts here. Thanks for writing from a fellow Mass woodworker! Actually, I have a question: which is the one to use for dovetail waste, the fret or the coping saw? I tried one of their saws in a shop (don’t remember the model) where the owner was not happy with it for that purpose because the frame flexed quite a bit, not in line with the plane of the frame but corners twisting in opposite directions. I’m sure that is the intended design for some applications but wouldn’t be ideal for dovetail work. Many bench chisels have a 90° side “bevel” of significant height, which can make it harder, though still possible, to clean out the corners when cutting the tails. Some people contend this is not a problem with any chisel because the saw kerf itself gives adequate clearance. Yea, true, IF you stop your saw cut fully up to (never beyond) the baseline. As a practical matter it does help a lot to have chisels with either a minimal land on the sides, like L-N’s, or the Japanese style that I discussed in the post that I linked to. Some authors, I think Lonnie Bird is one, have suggested modifying the first inch or so of an otherwise unsuitable chisel. It sounds like what you’re doing is working well for you. Stay with it! The KC fret saw with the #3 blade (5″ plain end blades) is great for removing dovetail waste. It slides right into the kerf and you can make a nearly 90° turn – no curving the cut and then sawing again to remove the remainder. I have not had a problem with twisting, even in 3/4″ wood. The blade does bow back when I hurry the cut but I just slow it up near the end, which I would always do anyway because I don’t want the blade to jump out at the end of the cut and nick the tail. The KC fret saw has really changed dovetailing for me. I’ve been using #5 skip tooth pegas blades for dovetailing, but I’ve never tried anything smaller, so I figured I’d try your recommended blades. But I grew confused when I was comparing the specs you listed in the post with the specs on Ben’s site. You say your favored blade has 19 tpi but no 19 tpi blades are listed on that site. So I just wanted to confirm that the blade you like (whatever the specs might be) is the Pegas skip tooth #3, which Ben lists as “SK3” on his site. Sorry for the confusion. Different sources for Pegas blades list slightly different specs. The blade I am suggesting is indeed the SK3 on the Ben’s Scroll Saw site. It is the Pegas #3 skip tooth blade. For the record, I measured one of my #3 blades at .012″ thick, .034 wide, and 20 tpi. The performance of the #3 is not a major difference from the #5, but I have found it cleaner and, surprisingly, faster. It has slightly less beam strength – it bows a bit more – than the #5 and #7, but I don’t find that to be a problem. Thanks, Peter. It’s a long slow road but there is progress.